Prince Do DPC Lusitano stallion imported from Brazil and sired by Quarteto Do Top and Grandsired by Afiancado Do Flandes .I imported him at the age of 6 and been doing the bloodless bullfights and exhibitions in california for the last 12 years.He just turned 18 in great shape Bomb proof horse does piaff lavade and bows. 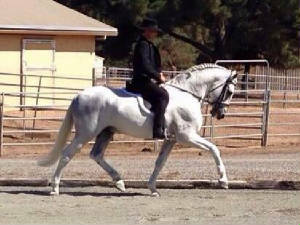 This is NOT just any Lusitano stallion this is an amazing stallion with great presence boodlines and training. Looking for the right home. Quarteto Do Top is one of the finest Lusitano stallions ever imported into America. His sire is the famous Afiancado De Flandes, five time Grand International Champion and leading sire of champions. Quarteto's athleticism sets him apart from others. His fabulous gaits are legendary. His expressive extended trot continues to wow the crowds. Initially trained at th...e well known stable of Haras Vale Do Arete in Sao Paulo, Brazil, upon arriving in the USA he continued his career as a successful FEI dressage competitor and breeding stallion. Quarteto is a very pre potent stallion. He produces size, bone, remarkable trainability, agility and impeccable dispositon. His head is readily recognizable in his progeny as well as his beautiful lines and powerful gate. At his revision in Brazil Quarteto scored a total percentage of 77.8 points. His head and neck scored a 7, shoulders and withers a 7.5, his croup an 8, his back an 8, his legs 7.5, and his movements an 8. His overall impression was scored an 8. His movements an 8. Quarteto has produced at least 23 PSL progeny. His son, Valiant, competes today at 4th level dressage. Vaquarius, is an up and coming dressage stallion with outstanding potential for FEI. 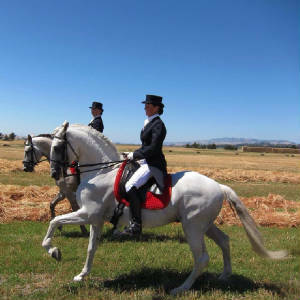 Notavel HM was imported from Haras Modelo ranch in Brazil by Costa's Lusitanos in 2000. 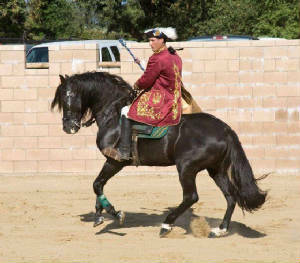 In 2001 he was shown at the Fiesta of the Spanish Horse in Burbank, CA where he wowed the audiance and brought home many 1st place awards. In the next ten years to come he had a storied bullfighting career. Notavel was bold and fearless when it came down to him being in the arena. 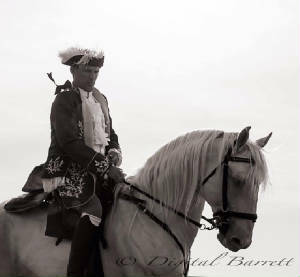 His athleticism and beauty are a tribute to his Lusitano heritage. He has an incredible cadence, correct conformation, and powerful straight movement. He has lovely extension, very well rounded with a short back, long legs and big neck with a gorgeous thick mane that he passes along to his offsprngs. He is extremely well mannered and has an amazing soft personality. In regards to his temperament, it does not get any better then Notavels. 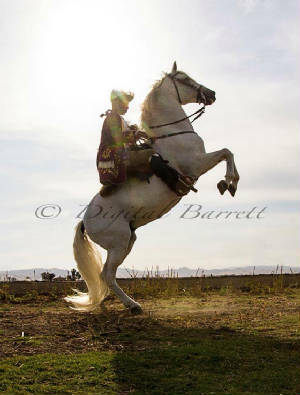 He is noble and obedient with a dramatic presence for which lusitanos are known for. *Registered in USA and Brazil. Precioso Do Top's father, Ocioso Do Top is by leading sire of champions and five time Grand International Champion, Afiancado de Flandes, and out of Urzelina, from Duarte Oliveira, branded stock a leading dam of champions. Zarco has one of the best and most amazing collections of lusitano stallions in his bloodlines you will ever see all out of the famous Manuel Veiga bloodlines starting off with his sire Quieto who was 2 time best horse in Brazil and in Mexico, Habil, Dardo II, Zimbro & the all very well known Nilo all in that exact order and this is only on his top half on the bottom he has Mistral do Top and the very accomplished Afiancado de flandes .If you know anything about Lusitano bloodlines you will know it doesn't get better then this. His offspring have remarkable personalities, acquire the same wonderful baroque look that everyone is looking for in a lusitano and have his elastic movements. Beautiful "Veigas" head and Incredible suspension in their gates. Just like they say about the Veiga Horses, they are so under themselfs, that their tail sweeps the ground. This is truly the complete package stallion Looks colour and bloodlines what more do you need.